AMD Foam Dressings are Antimicrobial to help prevent infections or to treat infected wounds. AMD Antimicrobial Foam Dressings are effective against bacteria. These AMD Antimicrobial Foam Dressings offer a balance of managing moisture and bacteria to promote Wound Healing. Compliant with most existing wound care protocols, AMD Antimicrobial Foam Dressings provide an ideal healing environment. AMD Antimicrobial Foam Dressings have been proven effective for up to 7 days. 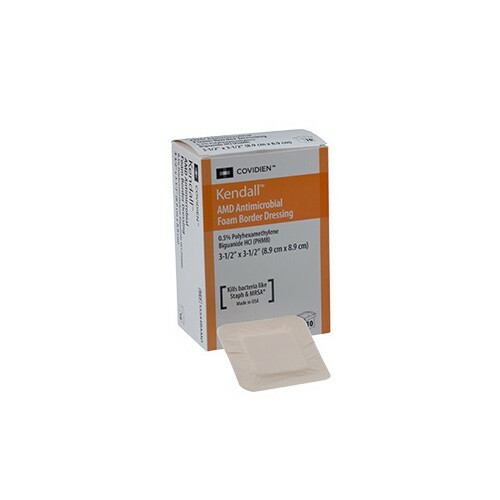 Manufactured by Kendall, AMD Antimicrobial Foam Dressings offer a significant savings when compared to most silver dressings. Kendall AMD Antimicrobial Foam Dressings have proven effective against MRSA and VRE, gram+ and gram- bacteria, fungi and yeast. AMD Antimicrobial Foam Dressings have a micro structured open cell surface that absorbs exudate. This wicking action moves wound fluid away from the wound to the inner foam core. The foam core is dense and maximizes retention of exudate. This Antimicrobial Foam Dressing is soft and comfortable for the patient. 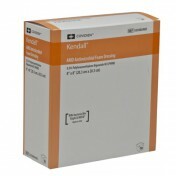 Kendall AMD Antimicrobial Foam Dressings contain Polyhexamethylene Biguanide (PHMB), a bacteria-killing polymer. Highly effective and safe, PHMB attacks bacteria on contact and limits cross-contamination. This wound dressing helps to provide a bacteria-free wound healing environment. PHMB is a safe, stable chemical with over 75 years of commercial use in such products as baby wipes, contact lens solutions and pool cleaners. PHMB binds to bacteria’s phospholipid (outer) membrane. Disrupts membrane, causing cytoplasm to leak out. Bacterial cell’s protective layer disintegrates. Bacterial cell collapses and dies. Nothing is left behind to mutate or replicate, so there is no known resistance. PHMB in the dressing continues to provide bacterial protection. AMD Antimicrobial Foam Dressings Form an Effective Barrier Against a Variety of Harmful Bacteria (Including MRSA, VRE and Enterococcus Faecalis). AMD Antimicrobial Foam Dressings are Efficient, Cost Effective and Compliant with Most Protocols. Effective for up to 7 Days. Proven Effective Gram+ and Gram- Bacteria, Fungi and Yeast. Timmons, John, Leak, Kathy. 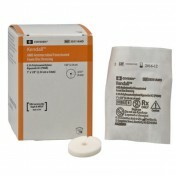 The Role of Kendall AMD Antimicrobial Foam Dressings in Treatment of Wounds. Case Study Covidienok.innd 2, March, 2009. Kirker, Kelly R. PhD, Fisher, Steve T., BS, James, Garth, PhD, McGhee, Diane, BS, Shah, Chirag B., PhD. Efficacy of Kendall AMD Antimicrobial Foam Dressing Against MRSA. Covidien, 2009. Meuleneire, Frans, Zottegem, Elisabeth. A Case Report on the Use of a New Ultra-soft Antimicrobial Foam Dressing Impregnated with 0.5% PHMB on a Venous Leg Ulcer with a Critical Colonisation. Presented at EWMA, 2009. World Union of Wound Healing Societies (WUWHS). Principles of best practice: Wound exudate and the role of dressings. A consensus document. London: MEP Ltd, 2007.